The game, and many others inspired by it, is well known for its three by three grid of moral persuasions; one axis ranges from Good to Neutral to Evil. It’s the second dimension here, an innovation of earlier editions of D&D, which became far more interesting and far more controversial; the one that purports to measure how “Lawful” or “Chaotic” you are. It turns morality into a set of coordinates: Lawful Neutral, Chaotic Good, Neutral Evil, and so on, with nine combos in all. But, quite arguably, it’s the meaning of “Lawful Good” which causes the most dissension, sitting as it does at a controversial collision of conflicting, received notions about law and justice. It even led to the coining of a popular bon mot among D&D and Pathfinder players who push back against simplistic interpretations of moral alignments: “It’s Lawful Good, not Lawful Stupid.” The admonition is meant to be a way of stopping players from “roleplaying” Lawful Good characters in ways that are mockeries of virtuous behavior--charging into the mouth of a dragon because it seems selfless, worshipping rules however banal or pointless they are, et cetera. The subject has fascinated me not only because Lawful Good was my favorite alignment, but because so much of the controversy around it exposed a good deal about the moral assumptions we would bake into game mechanics. It’s profoundly instructive for anyone who tries to make a mechanic of morality in their games or who wants their title to express moral ideas in a thought provoking way. It also illuminates the many problems we have portraying morality in games at present. The morality mechanics of D20 inspired games were always controversial, especially for those who played classes that had strict morality requirements, like Druids or Paladins. During roleplay, one false move could lock you out of your class and-- more urgently-- start a neverending philosophical debate at the game table. As a mechanic it’s meant to provide girders for the moral dimensions of your roleplay, a way to quantify it and provide rewards or consequences for how you RP. This is where we run into a classic problem of game mechanics; much is lost in the translation from ineffable to quantifiable. The D20 alignment grid shares this common failing with the primitive morality sliders that have existed in several roleplaying games, particularly in Bioware’s various outings over the years. What results from these aggregates of points, of additions and subtractions, is twofold: one, any worthwhile exploration of morality is lost in the mercilessness of scoring, and second, that players are compelled to game the system rather than play with it. The distinction there is important. 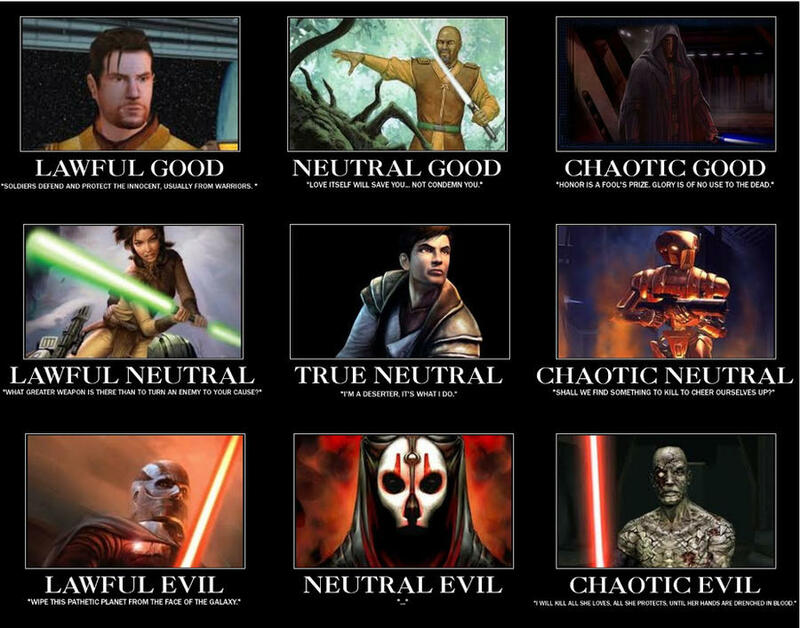 When I played Knights of the Old Republic, for example, I did what I quickly learned would net me “light side points”-- it became a simple matter of picking the obviously virtuous option, which was often declarative, simplistic and ethically uncomplicated, ultimately in the service of ensuring I played a “good” character (I felt guilty otherwise) and getting that lovely column of light around her in the character screen. But what I could never be encouraged to do in such a system is make anything other than a binary choice to achieve that predetermined state; it did not teach me much that I didn’t already know from basic, inoffensive, moral education. Put very brutally, both alignment and good/evil sliders are like moral vending machines that yield to the inputs of sufficient kindness (or evilness) coins, not unlike romance systems which were actually structured very similarly. Can they be saved, however? Yes, I think, and the answers are already out there in the form of more flexible and thought-provoking forms of gameplay. This was music to my ears. If law in the real world is to mean anything beyond being yet another plaything of the rich and powerful, this is a notion that we could all stand to learn something from: the ability to morally judge rather than genuflect to law’s cold edifice. Through these suggestive instructions, writer Wolfgang Baur compels players to think more deeply through their moral assumptions. There is no one right answer, just a general field that tests one’s moral maturity-- and mercifully, that maturity is measured by one’s ability to be nuanced. Baur succeeds by prising apart the assumption that what is lawful must be good and vice versa, something that remains relatively unusual in roleplaying games, sadly. Crucially, there is also an airy dimension to this moral test that Baur wrote up, one that refuses scoring. It leaves players free to be more thoughtful and inventive without excessively scrutinizing their every word for its adherence to a narrow conception of virtue. But what about in a video game where a player’s means of interacting are more limited? The key is to create openness and room to explore through the interaction. Are you compelling the player to simply make a red vs. blue choice or can you show them something more? Knights of the Old Republic 2 had a very different moral character from its more popular predecessor and placed a good deal more emphasis on demonstrating the limits of the player’s power. Kreia, your character’s mentor throughout the game and a steely-voiced advocate for moral ambiguity, bathed you in shades of grey that forced you to question deeply held assumptions. A rather (in)famous moment occurs when you land on the planet of Nar Shaddaa, a world-city characterised by extremes in vice and poverty. You are immediately confronted with what has long been a mainstay micro-moral choice in KotOR: a homeless man asks for spare change. What is interesting, however, is the way that Kreia intervenes: she lends you her Force sight to show you the consequences of your actions. No matter what you do, it ends badly for the poor man you’re asked to help. If you refuse him money, he stalks off in anger and beats up some of his fellow vagrants. If you give it to him, he becomes the object of their jealousy and they attack him. "Sometimes the best morality mechanic is not to have one; other times it means using the game environment itself to express moral ideas." Make no mistake, this is profoundly cynical, but it works on a number of levels: illustrating Kreia’s morality, for one, and also demonstrating that sometimes you as the player cannot make everything right. Sometimes you face a situation with no good options, where tokenistic acts of morality may have unforeseen consequences. It’s an interesting case where the restriction of player choice paradoxically opens up an exploratory space for the player. Moral expression and learning often happen under conditions of humility; we must confront our own powerlessness as much as our responsibility to justly use the power we do have. Though frustrating for players sometimes, such moments end up staying with us. Kreia’s moral musings stuck with me considerably more than some of the less interesting Light/Dark Side choices sprinkled throughout the game. Sometimes the best morality mechanic is not to have one; other times it means using the game environment itself to express moral ideas. Dragon Age 2’s affection meter (divided between Friendship and Rivalry) was intriguing because it measured levels of emotional attachment rather than a simplistic love/hate dyad; it permitted different shades of cathexis, a committed Rival could still fall in love with Hawke or still stand with her at the climax, it just flavoured the relationship very differently. A similar mechanic could be applied to moral distinctions as well, going beyond good and evil, and lending complexity to any recreation of the law/chaos dyad. The trick is to get the player to think outside themselves for a bit and set aside the instrumental goal of being 100% good or evil for the sake of stat bonuses or what have you. In this way, the blind obeisance to law commanded by the “lawful stupid” interpretation of Lawful Good in D20 is analogous to simple moral mechanics in videogames; each is lifelessly instrumental. Each bows before rules instead of true moral exploration. Permitting failure, giving the player a sense of the game world beyond themselves, opening up a wider array of choices, can all contribute to making videogames more morally interesting. There’s a long road ahead and the issues with morality mechanics tie directly into problems of choice mechanics and romance mechanics; they’re variations on the same theme of shortcomings. But there’s always hope-- and that’s a thought I know my old D&D Paladin would’ve approved of.